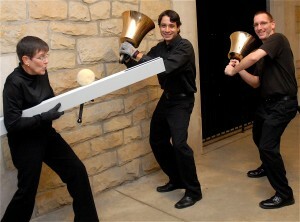 Three Rivers Ringers auditions musicians for all positions every 2 years. The last audition (for the 2017-2019 seasons) was held on Sunday, June 25, 2017 at 5:00 PM at Mt. Lebanon United Methodist Church in Pittsburgh, PA.
Auditionees are responsible for providing their own sheet music (for the prepared piece), pencil, gloves, and music folder. All auditionees are expected to have the prepared piece at performance level. Three Rivers Ringers rehearses at Mt. Lebanon United Methodist Church and performs on a variety of handbell instruments, including 7 octaves of Schulmerich handbells, 6 octaves of Schulmerich & Malmark handchimes and 2 octaves of Schulmerich Silver Melody Bells. Rehearsals are held on Sunday evenings from 6:00-9:00 pm with other rehearsals scheduled as needed based upon the ensemble’s performance schedule. Three Rivers Ringers repertoire covers a wide range of musical styles and genres, including original compositions written for the ensemble. The budget for the Three Rivers Ringers is primarily supported through financial contributions from the general public, the Board of Directors, and the Ringers themselves. Ringers selected for the 2017-2018 and 2018-2019 seasons are asked to make a suggested contribution towards the budget for the season. Auditionees must confirm availability for all concert “hold” dates for the coming year. All dates that must be held are listed on page 4 of the Audition Application. Please note that Three Rivers Ringers only accepts musicians age 18 or older. To audition for the Three Rivers Ringers, please download and complete the Audition Application and email it to Nancy Lutz, Artistic Director (artisticdirector@threeriversringers.org) or send postal mail to Three Rivers Ringers, P.O. Box 79180, Pittsburgh, PA 15216. If you have any questions, please contact Nancy Lutz, Artistic Director (artisticdirector@threeriversringers.org or 412.334.7987).